It’s been a hot minute word press! Education will do that to you. Yesterday, I graduated with my Master of Education, folks! I am officially an M.Ed.! That means that after 3 years of classes and over 700 internship hours I get to walk around knowing my email signature ends in “, M.Ed.” It’s pretty awesome. But in all seriousness, I am done! I get about 75% of my brain power back. Think of the possibilities, people! I could invent the next facebook. Or dorito taco. Or bounce dryer bar. Watch for me on Shark Tank! It’s an incredible feeling to not have to think about being a student anymore. For the time being until I find a full-time job once again, I can just be a mom. I can get our home back on track. I can manage our everyday, our budget, our menu….I can read stuff for fun (I’m a romance and just plain fiction junkie) and I can be excited about my job search again. Not to mention I can get back to #projectunfluff too! Nothing ruins a health revamp like trying to finish a grad program and internship! But now I’ve been hooded, the party has been thrown and cleaned up, the little lady has been put to bed and I’m sitting peacefully next to my partner with literally nothing else on my mind. 3 years of school, planning a wedding, planning for a baby and then raising said baby has meant that at this time every night, I went to bed with an endless amount of things on my mind. Tonight, however, I am calm, relaxed and my brain feels light and fluffy. Well not too light and fluffy, it’s a Master brain now so it’s got more stuff in it than it did 3 years ago, mmk? Most importantly, now that this chapter of my life is complete I’m astounded by the outpouring of love over these last few days. Those of you who have reached out to me to congratulate me, thank you. I know I’ve always been very vocal about this journey and to know that you’re just as excited as I am to have graduated only encourages me more to keep working just as hard in everything else I do. So now it’s on to the next chapter for me! At first, I was terrified because for the first time in my life, the next step is truly unknown. In these last couple of weeks I have experienced a huge range of emotions, from fear, to sadness, to anxiety and then finally excitement. I am starting to see the other side of all of this uncertainty and I’m excited that I don’t know what’s next but that there’s so much potential for it to be new and awesome! I certainly don’t see it as a vacation as the wee one keeps me gainfully employed at home. But it’s a privilege to be able to have this time to hang out with my kid and apply for the positions that are most compatible to my skills and interests. I’m looking forward to what will probably be the last time I get this kind of time off. That being said, if you have any book suggestions, let me know! Babycakes and I are hittin’ the library hard this summer! Woo! My very kind and supportive new interweb buddy, Ms. Emily Skinner who writes the Ah-mahzing blog My Journey Through Thick and Thin has nominated little ‘ol me for a Versatile Blogger Award! This award is given by bloggers to bloggers who deem certain blogs or specific posts as noteworthy. More about the Versatile blogger award here. I am honored to receive this award considering I have only written 7 (now 8) posts thus far and I feel as though it’s way too early in the game for me to be getting any such praise but those who know me know I’ll certainly take it! Holla! One of the rules after receiving this award is to tell my nominator 7 things about myself so why not share this with all of you as well? Ok, here goes nothing. 1. When I was in the second grade, I made up a dance to the Lion King’s “I just can’t wait to be king”. I wore the same overalls and flower hat (think Blossum) whenever I would perform said dance in front of family and friends. My aunt still talks about this little performance to this day. 2. I did my undergrad at the University of Michigan and will forever bleed maize and blue. My siblings went to Ohio State. I disown them one day a year when our alma maters play each other in football. It’s ugly. And awesome. 3. I used to keep a diary in high school but was so embarrassed by my terrible writing that I threw it out. I started a journal a few years ago and also get embarrassed when I read those. I guess by having an internet audience I create what I think is much more digestible bits of writing. 4. My partner is a poet and I an super jealous of his mad skills. 5. I talk to myself when I’m alone, often “rehearsing” upcoming conversations, especially if they involve confrontations. 6. Since the invention of e-books I’ve been able to get away with my obsession for trashy romance novels in public. 7. I tried to measure the length of my daughter’s eyelashes when she fell asleep in my arms the other day. Another rule of the VBA’s is to nominate 15 blogs/bloggers I have recently discovered for follow regularly. I would say I probably have quite the mix of blogs that interest me, particularly female/feminist writers and people who make desserts. So here goes! Well. That was a lot of work but well worth it! Be sure to nominate any fellow bloggers in your life too! 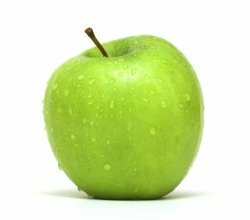 I’m sitting at my desk at work staring at a bright, green, granny smith apple and thinking to myself “how did I get here?”. Just a month ago that apple would have been a cookie. or a cupcake. or a mocha latte frapo crappo delight. After a poor physical with my new doctor and a serious sit down with myself, I’ve managed to snap into 2012 and take a look in the mirror. Not that I don’t like what I see, let’s get one thing straight, I’m a beautiful woman, mmkay? BUT, and it’s a big but(t) <– (see what I did there? always joking…) after years of poor eating habits and terrible decision-making, it occurred to me that I don’t even know if this is my true self I’m seeing. I don’t know what that self looks like because I’ve never made a conscious effort to make any real changes. No, let me re-phrase that: I’ve never made a conscious effort to do the things I’m supposed to do. My relationship with food goes way back. At some point in my elementary school years, my mom went back to school for her masters and I became a latchkey kid. With that came a lot of convenience lunches and cafeteria garbage. That later turned into fast food while juggling a hectic school/colorguard/choir/part-time job schedule. Over time, I started to actually get that there are good foods and bad foods but I never really cared much for these “facts” or whatever (sarcastic much?). By the time I left college, I had gained 15 lbs…a year. And I just kept moving on. I fell in love (gained love weight), started my master’s degree, got married (gained then lost then gained stress weight), then had a baby (you get the idea). And so here I sit, thinking back on all of the moments when I could have changed but didn’t. The gym memberships I payed for but never used. The bags of produce that went bad in my fridge while I went out for pizza/burgers/thai/ice cream/death on a stick. Oddly enough, I’m no longer angry or ashamed. I’m past all of that at this point. Now, I’m just scared. And suddenly very aware. So aware that when I “relapsed” yesterday (as in, had dinner at Wing Stop), I couldn’t stop thinking about the terrible things I was actively consuming. I dare say, it wasn’t all that enjoyable. I guess after a month of counting calories, limiting portions and cutting back on sugar/snacks/gunk, I’ve managed to retrain my brain and my body (talk about a churning post-wings stomach-apolyse!). The funny thing is, I feel like deep down inside, there’s been this little vegetarian exercise enthusiast all along. When we go out to eat now, I’ve started going for the meatless options or a side salads and fruit instead of fries. Last week I made brussel sprouts and quinoa. My carnivorous husband, bless his heart, graciously takes a bite (sometimes) even though I know he’s secretly cringing on the inside. But I’m enjoying this, I feel like instead of being passive about what I eat, I make myself a part of it by really studying ingredients, looking up calories, analyzing recipes and finding ways to substitute the bad stuff for the good stuff. I even made granola at home the other day, people! I am grinding flax seeds and saving up for a personal smoothie blender for goodness sakes. Over the weekend, I walked for several hours. HOURS. Instead of sitting on the couch, I cleaned the kitchen, baked and crawled on all fours with my 10 month old (who loved it, btw). I looked up healthy recipes and stored them on pintrest. I’m even trying to figure out what my schedule would look like when I incorporate Zumba into my week. what? who? huh? I know. #projectunfluff is underway folks, there’s no way around it anymore. I plan on hopefully not ever looking back on a life once full of apathy towards nutrition and disdain for exercise. And I have a deadline. Children start making memories at age 2. I need to make like fluffy mami never even existed by May of 2013. Let’s get to it! so this particular topic has been on my mind for a hot minute. motherhood is awkward. it is and there’s no way around it. imagine this (or if this really is you, just look in the mirror): you have no children. you live your life doing whatever, going to bed whenever, eating and drinking what you want, showing up to work on time, staying behind a few minutes here and there to chat or finish an email. catch my drift? YOU get to do what YOU want because YOU answer to YOU. and then suddenly, every single thing you do is connected to another human being. a tiny, almost entirely helpless human being. at the very beginning of my pregnancy, (you know, the stage before people know), i started randomly turning down alcohol, deli meat, sushi, soft cheeses, and runny eggs. basically every delicious thing my friends and family watched me consume by the truck load for years. and then the random napping begins because the first trimester is so exhausting. my boss caught me napping at my desk at one point and a few months later had to ask me why i spent my lunch break sleeping in my car. pregnancy made me feel as though i suddenly had no place in the world, like i was living this very temporary alternate life. and it doesn’t end there. we all know how i feel about #overitpregnantedition. once visibly pregnant, the comments, the stares and the touching had me lurking around trying not to bump into people or i would rapidly find a seat at meetings or in class so i could sit down and cover my belly with my hands or a table. and as i got closer to giving birth, people seemed to be running circles around me pulling up chairs and offering to fetch me things like water, snacks and new, less swollen ankles. and i loved the attention, but it was still weird. i’m not gonna get into the whole birth thing, that’s not really awkward it just is what it is. but then baby and i are now two disconnected people and since i am no longer with child, it’s a lot harder to hide the crazies. in my case, the biggest, most awkward challenge has been breastfeeding. it’s one thing to be attached to a baby in the privacy of my own home but it’s another thing to go to work and put paper up over the window to my office or having to answer quick questions through the door because i’m pumping. then there was that one time that i got so upset about a comment about my body that i started to leak everywhere. talk about having to walk away without a shred of dignity left. my favorite moment of motherly awkwardness? washing pumping related equipment in public places like the bathroom. in front of co-workers. in front of a supervisor. in front of 18 year old undergrads.uhhhhh yeeeeaaahhhhh let me just…ok…i’m putting it away now….i just…..sigh. how about when my daughter wants to nurse suddenly? know what she does? she tries to pull up my shirt, bury her head in my chest and if I’m really lucky, she will motorboat my cleavage. in public. yah. then there’s zombie mondays that never cease to end. you can bet that if you want me to embarrass myself, ask me a really complex question at 9 am on monday mornings. you’re welcome. and if it’s 5 pm, don’t start a new conversation with me because i am not having it. i need to be out the door, in my car and on the way to pick my daughter up on time. i don’t stick around to chat it up, i don’t go to happy hour and i don’t want to grab dinner. i want to go home and hang out with my kid who goes to bed at 6:45. i’m on a time crunch and right now she’s my social life. if that means i have to be all behind on the gossip and the fun times then so be it. that’s what my undergrad was for. and if you’re a mom too and you know what i’m going through, i’m going to want to talk about it. i want to ask you about what happened to your body and baby toe jam and baby poop. i want to know what you do to get your kid back to sleep, or how you deal with teething and feeding solids. i want to connect with you so badly that all the non-parent people in the group will feel shut out and skulk away. and i’m not going to feel bad because right now i need to feel like i’m not crazy and talking to others going through the same thing is what will help me feel that way. my social etiquette is out the window, i’m basically napoleon dynamite with smaller teeth. and i’m ok with that. Earlier this week I attended a lunch with my department to celebrate the end of my practicum and the beginning of my internship. All of the other interns were there along with our supervisors and the good food and conversations began to flow. Suddenly, one of the supervisors began asking myself and another intern, who is also a first time mom, (we are the only two interns with kids) what it’s like to have a child. She asked us what it’s like to always be tired, what it felt like to be constantly woken up, to have our homes turned upside down, and to be “dealing with so much”. I was shell-shocked. Work-wise, I had only interacted with this woman, let’s just call her Mz. Type A or Mz. A for short, three times in my life. She seemed very nice, professionally focused, and her office was always impeccable so I wasn’t entirely surprised about the kind of questions she was asking. But goodness, the assumptions! What did she mean by dealing with so much? And why were all of these questions so negative? As we (other intern mama and I) stared at her in utter confusion, she began to explain that what she meant was that it just seemed to her that having a child in your life spells unpredictability and chaos and that as a newlywed, she couldn’t imagine giving up so much control in her life and in her relationship. As awesome-fellow-intern-mama tried answering some of her questions I pondered what my response to all of this might be. Did I even feel this way about having my daughter? I mean sure, having my daughter has certainly changed my life dramatically and there have been many things that have happened and will continue to happen that are out of my control. And yes, there are times when oh lord I could use more sleep. I knew this going in and I just roll with it because what else is there to do? I am a parent now. My mother and father stayed up with me as my teeth came in or until my fevers broke. They took off of work to nurse me back to health or to take me to the doctor. They left their classes and jobs early to take me to practice or performances. And they happily let me go when they were done with that part of their jobs as my parents. It came second nature to them and it comes second nature to me now. But. Many folks already know this about being a parent. Mz. A was raised by caring adults and she is educated enough to know all of these things but that’s not what she was getting at. She was asking us what it was like to have everything about our very beings challenged 24/7. When I finally figured out what to say, all I could think of was “well, yes my kid still wakes up at night and I am constantly dropping everything for her but my experience so far has been you either let it get to you or you don’t.” Her response? “yeah but it just seems like it’s a lot of change and I don’t think I’m ready for that”. As I was processing this later with my partner, I was being very judgmental as I told him that because she has a Type A personality (definition here), she of course can’t imagine having such little control over something so small as a child. But upon further reflection, I feel as though I might have misjudged the situation. Of course it’s easy for me to say, hey, if you let it get to you, that’s your problem. I have always been the kind of person that just goes with it. I never had a choice in the matter, I’m the youngest of three children in a unique way. My parents had me at 35 years old in the mid-80’s which was considered old at the time. I was born to an 11 year old sister and a 9 year old brother with already established lives. No one was ready for a NEWBORN. So, I have always had to just roll with it. I hung out on the laps of family friends or in a play pen while my parents kept going to their tennis matches or cheered on my brother at baseball games. I played on the floor while my mother fitted my sister’s bomba skirts for her dance performances. So naturally, I have learned to just go with the flow since the beginning of my awesome existence <–Youngest child much? Mz. A wasn't saying no to motherhood, she was just asking us to please help her understand so that she too can someday be able to have the courage to give up so much control. I can make assumptions about how she thinks or how she operates but I will never fully know. All I know is that the thought of becoming a mom is rocking this woman's boat right now. I know what it's like to be in her shoes. I was once there, when I fell head over heels for a man 10 years my elder. It was then that I realized that if I stuck with him, I could potentially become a wife and mother much sooner than I ever imagined. I was only 22 years old at the time and I felt like I might be giving everything up much in the same way that Mz. A was implying. But eventually something just clicked and my fear of having a child turned to excitement, then anticipation and lastly, impatience over meeting our little booger but that's another story (i.e. #overitpregnantedition). My only hope is that if Mz. A and her partner ever decide to have children, or perhaps are, ahem, somewhat thrown into having a child (hey, I was a happy accident. you're welcome. ), that she finds peace with the unknown. If not well then g'luck lady, I have my own #adventuresinparenting to worry about. It has finally happened. I have created my own teeny tiny universe in which I can do two very opposite things: write long elaborate narratives about what is supposed to be summed up in a hash tag line. You see, I’m a big fan of the hash tag concept. What better way to sum up thoughts and/or situations than a bunch of smushed up words that take a good minute to seperate by reading them aloud a few times? Stop it, you know you do that. I love the hash tag idea but I’m a bit backwards in how I’ve been using it. I’m what you would call that annoying chick on Facebook who uses hash tags like she’s on twitter. If she actually logs into, twitter she gets so overwhelmed by all the tweets in her feed that she shuts down and/or only retweets stuff instead of coming up with anything original on her own. Yeah, uh, that girl. Then, a person can search for the string #Wikipedia and this tagged word will appear in the search engine results. These hashtags also show up in a number of trending topics websites, including Twitter’s own front page. Such tags are case-insensitive, with CamelCase often used for readability. Definitions for some hashtags are available at hashtag.org. Hashtags were invented on Twitter by Chris Messina. One phenomenon specific to the Twitter ecosystem are micro-memes, which are emergent topics for which a hashtag is created, used widely for a few days, then disappears. Other sites, such as Hashable, have adopted the hashtag to use for other reasons. The feature has been added to other, non-short-message-oriented services, such as the user comment systems on YouTube and Gawker Media; in the case of the latter, hashtags for blog comments and directly-submitted comments are used to maintain a more constant rate of user activity even when paid employees are not logged into the website. Real-time search aggregators such as Google Real-Time Search also support hashtags in syndicated posts, meaning that hashtags inserted into Twitter posts can be hyperlinked to incoming posts falling under that same hashtag; this has further enabled a view of the “river” of Twitter posts which can result from search terms or hashtags. Anyway. It is my personal belief that the concept of using smushed-up-words-preceded-by-a-hash tag is really great and it should pretty much just be adopted by the English language as a whole (This is my way of getting out of the fact that I’m Twitter-lazy). But in all sincerity, what better way to categorize the happenings of life? I mean, my life in particular needs quite a bit of categorizing if I’m even going to get by. I’m a new mom (#mamifail, #mamiwin, #adventuresinparenting, #overitpregnantedition (easy kids, this will be written about as FLASHBACKS, I’m not knocked up currently. I repeat, NOT currently bakin’ baby buns. )), a full-time graduate student and (unpaid) intern (#gradintern), and an all around snarky, witty, sarcastic, ENTP (MBTI, holla! #gradintern joke…) woman who always has a lot to say (#icanhas(blank)?, #imjustsayin, #getchusome). Oh and to go along with #myhashtaglife I have dutifully created a Twitter account just for this little gem in the blogosphere. Don’t say I’m not willing to change! Oh and uh, like, totally follow me @myhashtaglife. Yeah. That felt weird.